Home BUSINESS EMPOWERMENT Rabbit farming, an unexploited ‘Goldmine’ that is greatly overlooked. George Njoroge (in red cap) explaining to a group of farmers about rabbit rearing. With him are RABAK Deputy Chairperson Grace Njihia (in white dust coat) and Hand in Hand instructor Lita Rwigi (third left). Traditionally, consuming rabbit meat was frowned upon in many communities. However, rabbit farming is fast catching on as more and more people venturing commercial rabbit farming mainly for their profit as George Njoroge, a rabbit farmer in Kiganjo Estate in Thika attests to. With over 10 years’ experience in the venture, Njoroge resorted to rabbit farming after his retirement and reckons that with rabbits, it is possible to make all returns on investment within the first three months. While speaking during a farmers’ workshop organised in Thika by Hand In Hand Organisation, he explained that raising rabbits was one of the simplest things anyone could do on their homestead. He extolled other people and especially the jobless youth in the region to join rabbit farming as the occupation is easy to practice and doesn’t require as much land as other forms of animal husbandry. “They are my main source of income. They have enabled me to feed my family, clothe them, and meet their other expenses. Not only do rabbits require little attention and less labour compared to other livestock, they also provide a great amount of meat,” explained Njoroge. Njoroge nonetheless admitted that Kenyans were not yet accustomed to eating rabbit meat even though it was generally accepted as possibly the healthiest of all meats. Rabbit Breeders Association of Kenya (RABAK) Kiambu Chairperson Peter Waiganjo says that rabbit farming is now becoming a new wave among many local small holder farmers. He reckons that there exists a very big demand for rabbit meat but the supply was still not adequate. To meet the demand in the market, RABAK, which has over 3,000 members, is applying aggressive marketing strategies to ensure that farmers are well positioned to determine the market price for their products. “One approach is forming small holder associations (SHA) of farmers in order to avoid exploitation by middlemen. We have partnered with the authorities who have assisted us in providing an abattoir in Thika which slaughter rabbits every Wednesday,” explains Waiganjo. Though complete, the abattoir needs freezers so as to enable them operate full capacity and achieve their goal of supplying rabbit meat to both the local supermarkets and the regional market as well. His deputy Grace Njihia adds that RABAK has now introducing value addition of rabbit products into their menu though their work is being complicated by the lack of enough supply of this delicacy. “We are now venturing into value addition and introducing secondary products such as rabbit sausages which are now becoming very popular in the market. Our only challenge is that production is very low and can only appeal to more and more people to join in rabbit farming,” says Njihia. 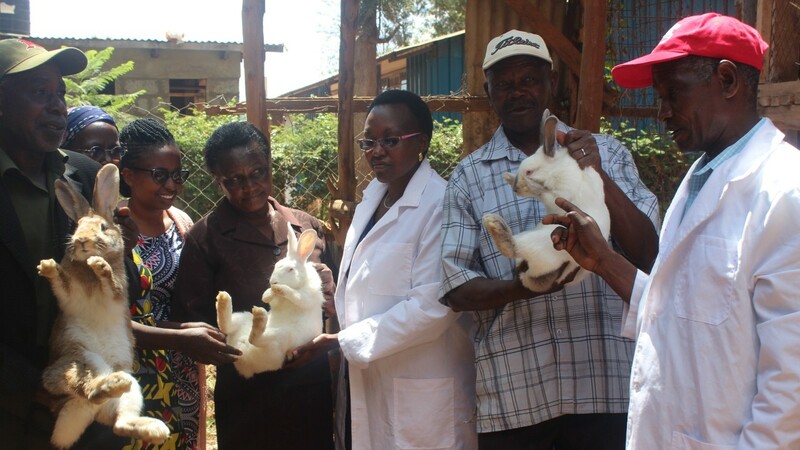 She is also appealing to local leaders to empower rabbit farmers through financial assistance, creating more public awareness and assisting organisations dealing with rabbit farming to offer the requisite training on entrepreneurial skills to survive in the competitive business environment. She adds that they are working closely with Kiambu County Government to create a conducive environment for small and medium businesses to thrive and build networks with neighbouring counties. Lita Rwigi, an instructor with Hand in hand says that their goal when organising the workshop was to assist groups especially those from the semi-arid regions of Maguguni and Ngoliba vision venture into viable agribusiness projects such as rabbit farming. “Agribusiness is emerging as the biggest option to joblessness. Our mission as Hand in Hand is to reduce poverty through enterprise development and job creation by encouraging people to start ventures such as this for commercial purposes,” says Rwigi. By partnering with RABAK, Hand In Hand hopes to boost the production of rabbit meat in the country, not only to as to satisfy the current high demand in the market but also to empower local communities. Currently, a kilogramme of rabbit meats sells for between Sh. 400 and Sh. 500. A mature rabbit trades for about Sh. 3,500. The most common rabbit breeds that are reared in Kenya include; California white (meat), Chinchilla (meat), Flemish Giant (meat), New Zealand White (meat), Angola and Rex (Fur), Dutch and French Lope. Rabbits feed on vegetables, vines, dried grass and water. However, supplement feeds are fed to the rabbits to boost their weight gain. Rabbits should be slaughtered when they are at least six months old.